Becky Falls, a natural waterfall with a 70 foot drop, is considered one of Devon’s top beauty spots. 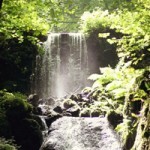 Situated in a picturesque valley, gives beautiful woodland and waterfall walks. It is a “Visitor Attraction”, so in addition to the wonderful waterfall and beautiful walks, there are family activities, a collection of animals and, of course, an admission charge. An awesome stack of granite on the northern slopes of Dartmoor’s Hayne Down close to Hound Tor. 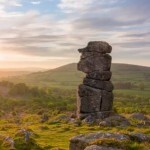 According to Dartmoor Legend, the stack of granite is a famous Dartmoor hunter called “Bowerman” who was turned to stone by witches along with his pack of hounds. Although only a short drive from Lustleigh, you could get there by taking a rewarding 4 mile walk straight from the holiday cottage cutting across the Cleave heading towards Water – but remember, it is a 4 mile hike back! 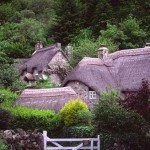 Situated on the edge of the moor with a medieval church, this village is considered one of Devon’s dream villages – almost as good as Lustleigh. If you’re looking for something interesting take a close look at the church’s clock face. 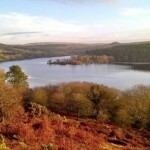 A reservoir may seem an odd thing to put on a “must see” list but the one at Burrator is simply stunning. 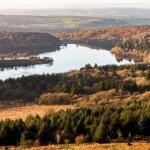 There is an abundance of easy walks giving great views across Dartmoor with plenty of wildlife wandering about. 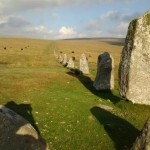 Its also a good gateway for a hike over Down Tor and along to the incredible stone row and cairn circle (see below). At 220ft, Canonteign Falls is the highest waterfall in England and stunning. 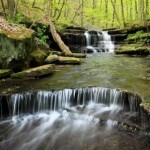 As with Becky Falls, it has been developed into an attraction so there is an admission charge. A large granite cross standing a metre high marking the spot where Childe the Hunter died. 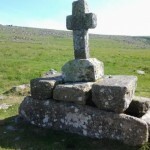 This is one of the most elaborate Dartmoor crosses. Childe was a wealthy lord who loved hunting. On his last hunt he became separated from his companions and trapped on Dartmoor during a violent storm. In order to survive the cold he killed his horse, disembowelled it and climbed inside – I seem to recall Han Solo doing this trick in Star Wars. Unfortunately for Childe, he was less successful. You would think that was the end of the story but no – Childe’s will and testament had left his estate to the local church of wherever he was buried. As news spread of his death on Dartmoor, a race to recover his remains ensued between the people of Plymstock and the monks of Tavistock Abbey. The monks won the race by thwarting an ambush and building a bridge but that’s another story. A short hike from Burrator Reservoir (park at the Norsworthy Bridge car park on the Eastern edge) leads you to this wonderful long row of standing stones and a cairn circle reminiscent of “Outlander”. 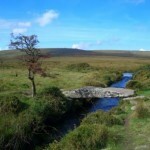 The glorious views across Dartmoor as you cross Down Tor are well worth any uphill struggle. Probably the most visited Tor on Dartmoor, Haytor features in numerous postcards, sketches, paintings and photographs. Given its close proximity to the road it’s an ideal place to get great views across the moors without much of a walk. 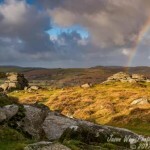 Of course there are some good easy walks around Haytor – the Granite Tramway, which was used to transport granite from the quarry down to Stover, is a popular one with both locals and visitors. 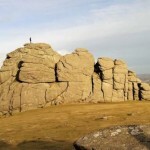 Haytor is also very popular with climbers with several routes to the top including an easy one for non-climbers. Kitty Jay was only a young servant girl but she has since become famous in Dartmoor folklore and ghost stories. She was seduced by the squire’s son and fell pregnant. After being thrown out of work she became desolate. Sadly Kitty committed suicide and was found hanging in one of the barns at Canna farm. Like so many suicides of her time she could not be buried on consecrated ground, so she lies in a raised grave at the intersection of a road and a moorland track forming a junction of three parishes: Manaton, North Bovey and Widecombe. On some moonlit nights a dark figure has been seen kneeling at Jay’s grave. 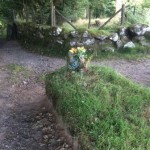 Legend says that every day you will find fresh flowers on Jay’s grave yet nobody has ever been seen leaving them – some say it is the work of Dartmoor pixies who tend the grave out of sympathy. 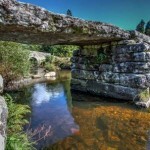 The small hamlet of Postbridge is home to a fabulous 13th century Clapper Bridge crossing the East Dart River. To add an interesting contrast, there’s also an 18th century Granite Bridge for the road. Children love crossing the Clapper Bridge and there are lovely easy walks along either side of the river. The Dartmoor National Park Visitor Centre makes for easy parking. Often referred to as the Stonehenge of Dartmoor, this bronze age stone circle situated on Gidleigh Common is Devon’s largest and most intact. 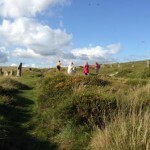 There are over 20 standing stones, some as high as 2.5m, and about 11 fallen stones. Although there isn’t any specific Dartmoor legends relating to the stones, there are many reports of “strange happenings”. A more recent one dates back to 1998 when a herd of Dartmoor ponies took it in turns to enter the circle and stand still in the centre for about a minute before returning to the herd. 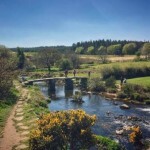 From Batworthy Corner, it’s an easy and pleasant walk to the Stone Circle that takes you across a Clapper Bridge and past the Tolmen Stone (see below). 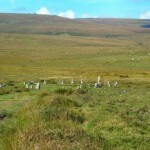 Spitchwick Common is a very popular spot on Dartmoor for families. 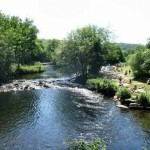 You can swim in the river, picnic/bbq and explore. In 1928, local landowner William Whitely commissioned God’s commandments to be inscribed onto two large granite slabs on Buckland Beacon. It took the stonemason WA Clement 5 ½ weeks working 9 ½ hours a day to cut the 1,547 letters and cost the princely sum of £50! In addition to the ten commandments, there is a short poem and a quotation from the Gospel of St John. 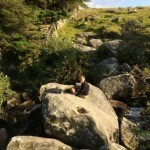 A short walk from Batworthy Corner will take you to the Teign River where on the opposite bank you will find the magical Tolmen Stone – a boulder with a large hole running through it, presumably caused by water erosion. 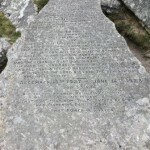 The Tolmen Stone has earned its place in Dartmoor Folklore for healing and aiding fertility. I can testify to this as after passing through the stone, my persistent back complaint of several years dissipated within hours. I also know a young lady who after trying for children for several years, climbed through the hole and fell pregnant with twins shortly after. Putting that aside, kids love climbing through it. Famous for its annual fair in September and “Uncle Tom Cobley an’ all” of course! 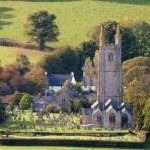 Widecombe also boasts an impressive church known as “the cathedral of the moor” which was visited by the devil, according to the “Evil Rider” legend.